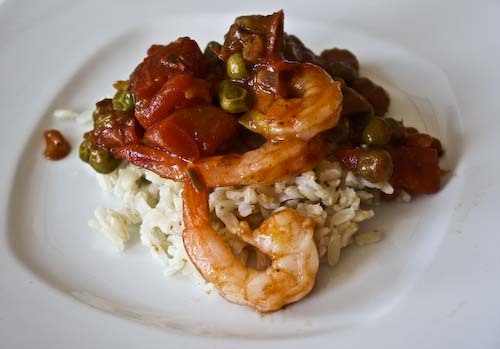 This is a fairly paired-down shrimp creole, perhaps not for the purist. But it's also a "pantry dish" in that most of what is required, you probably already have. If I had been feeling a bit more ambitious, I might have chosen to build layers of flavor with homemade shrimp stock made with shrimp heads and shells and a leftover fish carcass. Shrimp heads, which we hardly ever see in the US, have the benefit of being relatively fatty and are naturals at contributing their lushness to a stock. I might also have added in pork lard, if I were feeling authentic. But I wasn't and this dish was never meant to be a project. You have to choose your battles, after all, and this was lunch on a Sunday afternoon. Instead, it's the sort of thing that comes together easily and satisfies mightily. I doubt it would hold up in a head to head comparison with the "real stuff" as far as decadent flavor. But sometimes decadence is not what you're after, and enough is as good as a feast. Sauté the onion and the celery over medium heat in the olive oil until transparent. Add in the chili powder and the flour and mix thoroughly. Mix in the tomatoes and peas and bring to a simmer. Add the sugar and Tabasco, and season with salt to taste. Add the white wine and simmer until the sauce is thickened, about 15 minutes. Add the shrimp and toss to coat. Continue cooking only until the shrimp are heated through. Serve over rice. 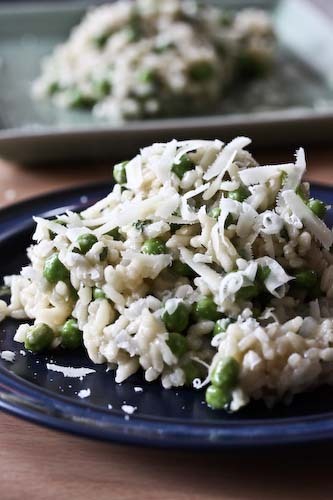 * It's fine to use frozen green peas, but thaw them out before you use them. 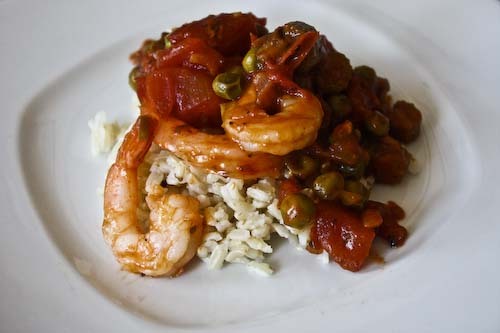 * The recipe originally called for a 17 ounce can of tomatoes, but I had a 14 ounce can of tomatoes in Italian seasoning, which worked out well because the herbs replaced the thyme and basil one might usually find in a shrimp creole. * I used 1 cup of brown Texmati rice, which required 2 1/4 cups of water. Brown rice usually requires more water than white rice does, so follow package instructions. * If you start the rice at the beginning of the process, you'll finish just after the rice has been taken off the heat and given a little time to rest (this is done so that the moisture will redistribute and all the rice will be fluffy, not just the rice on the top). Yum! that brings back fond memories of my trip to NOLA. what a nice plate yummy! I know nothing about Creole cooking but it's great to learn and this looks really tasty. Sam, I don't know much about it either, but I'm learning!